That’s exactly the way I feel whenever I teach someone something about the computer. It pisses me off to no end. It’s a frickin ! @#$% in the sky! It’s a frickin blimp meant for surveillance and communications. This fall, there’ll be a new and extremely powerful supercomputer in Afghanistan. It’ll be floating 20,000 feet above the warzone, aboard a giant spy blimp that watches and listens to everything for miles around. That is, if an ambitious, $211 million crash program called "Blue Devil" works out as planned. As of now, the airship’s "freakishly large" hull – seven times the size of the Goodyear Blimp’s – has yet to be put together. The Air Force hasn’t settled yet on exactly which cameras and radars and listening devices will fly on board. 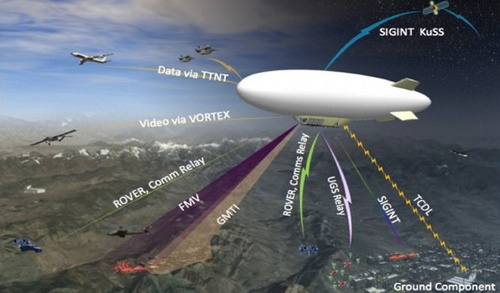 And it’s still an open question whether the military can handle all the information that the airship will be collecting from above. Oh, it’s going to be crazy. Because. The footage can easily overwhelm the people who have to watch it (not to mention the military’s often-fragile battlefield networks). Already, 19 analysts watch a single Predator feed. Gen James Cartwright, vice chairman of the Joint Chiefs of Staff, told a conference in November that he’d need 2,000 analysts to process the footage collected by a single drone fitted with WAAS sensors. And that’s before the upgrade to the next-generation WAAS, which uses 96 cameras and generates every hour 274 terabytes of information; it’d take 1,870 of the hard drives I’m using right now to store that much data. It’s kind of. Obvious isn’t it?